Ganesh Chaturthi 2017 is celebrated with great devotion all over India. People bring home murtis (Idols) of Lord Ganesha and celebrate the festival by worshipping the Lord in a special way for a day and a half, 3 days, 5 days, 7 days or 11 days depending on the family tradition and commitment of each individual. Devotees worship Ganesha idol for 10 days and then on the last day of worship those idols are taken out in a colourful and musical procession to be immersed traditionally at a beach or nearby rivers and ponds. get immersed in water at the end of the festival. Ganesha Chaturthi 2017 Tithi: According to Drikpanchang, the Tithi begins at 20:27 PM August 24 and end at 20:31 PM on August 25. Ganesha Chaturthi 2017 Timings: It is believed that Lord Ganesha was born during the Madhyana period (noon) and hence, the recommended Puja timing is in the afternoon.According to Drikpanchang, you can conduct the Puja between 11:25 AM to 13:55 PM on August 25. Ganesh Chaturthi 2017 Puja Vidhi: On Ganesh Chaturthi, Lord Ganesh is worshipped as the god of wisdom, prosperity and good fortune. Ganesh Chaturthi brings people of all religion, caste, and creed together. Ganesh Chaturthi or Vinayaka Chaturthi is one of the most colourful and widely celebrated festivals in India. Lord Ganpati is first of all popular Gods. His blessings are important at most religious ceremonies as He is the one who can remove all obstacles to success. He is the giver of fortune and can help to avoid natural calamities. A Large number of people Performs Ganesha Chaturthi poojas at their home. Mithya Dosha Prevention Mantra: Depending on start and end time of Chaturthi Tithi, the sighting of the moon might be prohibited for two consecutive days. According to DrikPanchang.com rules, Moon should not be sighted while Chaturthi Tithi is prevailing. Further, Moon risen during Chaturthi should not be sighted even if Chaturthi Tithi gets over before moonset. However, not just the states of Maharashtra, other regions in the country to celebrate this joyous festival. 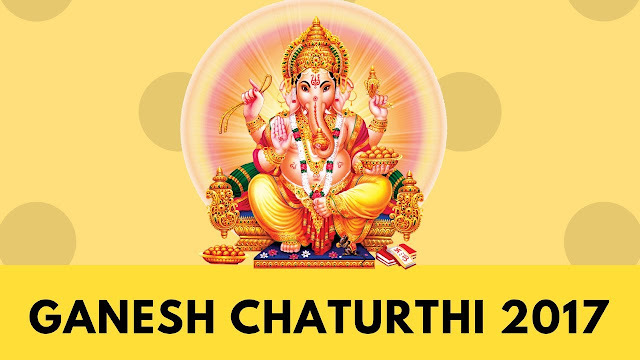 Ganesha Chaturthi is celebrated at homes in the state of Goa, Karnataka, Andhra Pradesh, Telangana, Tamil Nadu and Kerala too.Devotees in different parts of the country to offer their prayers by conducting a Puja at their homes. IndianTalks wishes All Viewers A Very Happy Ganesha Chaturthi 2017.